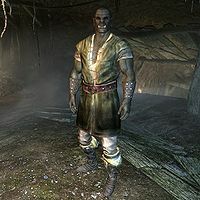 Mul gro-Largash is an Orc warrior found in Narzulbur's Gloombound Mine. He stays in the mine all the time, sometimes sitting to take a break, but never eating or sleeping. Originally from the Largashbur Orc Stronghold, he left with his brother Gadba and a lofty scheme. Mul wears a set of farm clothes along with hide bracers and matching boots. He carries a pickaxe along with a leveled war axe, which can be up to Orcish in quality. Mul will happily share with you the scheme he has created: "Gadba and me came to work the mine. The plan is to get rich and then go back to Largashbur and take over!" He will also tell you how Gadba and him got a job working at the mine: "Mauhulakh brought us in when he found ebony in the mine. Not enough men in town to work it, so here we are." He will also tell you about what he misses from living back at Largashbur: "One of these days we need to head back to the Rift. Get some of that good Riften mead." Mul: "How much longer do we have to work this backwoods mine?" Gadba: "A bit longer, yet. We need more money if we want to be chiefs of our own." Mul: "But I thought there was only one chief." Gadba: "Well, right. One of us will be a chief." Mul: "What about the other one?" Gadba: "There's only one chief!" Mul: "I found a big load of ebony at the bottom pocket in the mine." Gadba: "Did you mark it?" Mul: "No, I don't need to mark it. I remember it." Gadba: "So where is it?" Mul: "You can tell it because it has lots of ebony." Mul: "Do you ever get a weird feeling about those sisters?" Gadba: "Who has a sister?" Mul: "Mauhulakh's aunts. You know... the way they're all around him all the time." Gadba: "That's just how it is with families. When we're chiefs, you'll see how it is." Mul: "Can we both be chiefs?" Gadba: "Not today, we can't." Gadba: "Sometimes I think your head is made of rocks." Mul: "That would be good! I could use it to smash other rocks. Easier to mine, then." Gadba: "Oh, good point. I wish my head were made of rocks." Dushnamub: "Father, I'm worried about Gadba and Mul." Dushnamub: "You don't worry about two Orc men coming into your stronghold? That they might challenge you?" Dushnamub: "I've just learned not to trust luck around here." This page was last modified on 21 April 2014, at 09:19.